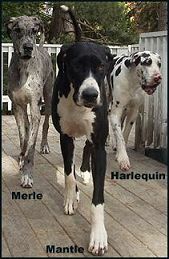 What is a Harlequin Great Dane? 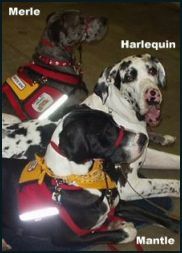 Harlequin is a specific color pattern. 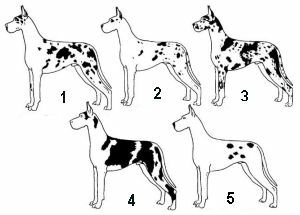 6 SHOW colors of Great Danes. over the entire body; a pure white neck is preferred. nor so small as to give a stippled or dappled effect. to give a salt and pepper or dirty effect. shall be faulted to the extent of the deviation. 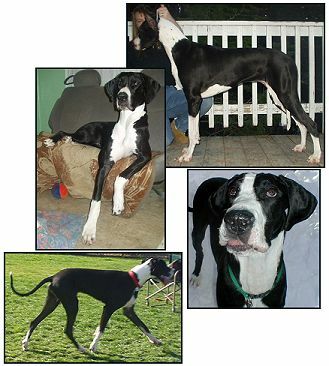 A Great Dane which does not fall within the above color classifications must be disqualified." is left are both outside the desired range. black patches on the chest and legs. should not be penalized. " Why is this color called a Harlequin? to the point that they lost their original color & material. Arlecchino could not read or write so made his meager living as an acrobat and a clown. (and future entertainers who dressed like him) with their clownish antics. with the only noticeable difference being that they have merle (grey) somewhere on them. 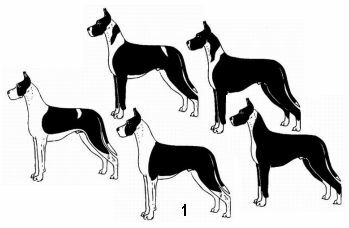 What is a Mantle Great Dane? 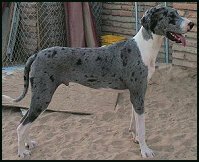 Mantle is a specific color pattern in Great Danes. 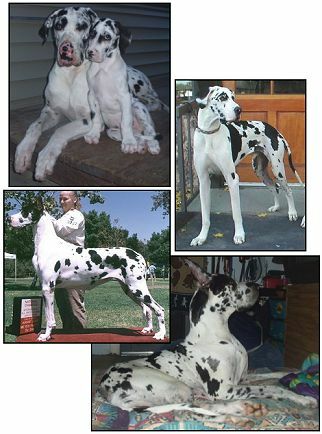 recognized 6 SHOW colors of Great Danes. a white chest; white on part or whole of forelegs and hind legs; white tipped black tail. A small white marking in the black blanket is acceptable, as is a break in the white collar." The rest are within the written standards' description so are showable. Why is this color called a Mantle? which is left open in the front and is often sleeveless. heavy marked or blanketed Harlequin. Some parts of the world still refer to this color as Boston. Mantles often come from Harlequin breedings. 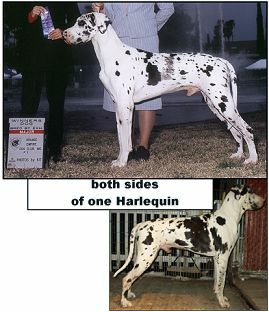 Mantle bred to Mantle cannot produce Harlequin. Luca, Phoenix, Talon, Fortune, DJ, Loke, Tano & Reveille. 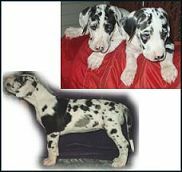 What is a Merle Great Dane? 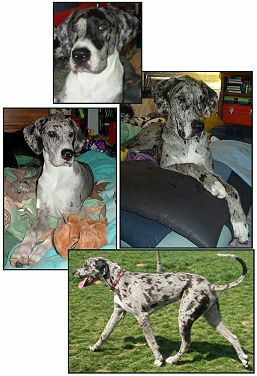 Merle is a color of Great Dane. that commonly comes from Harlequin breedings. does NOT mean it isn't AKC registerable. Non-show colors are not rare. (but not always) with black patches. & many shades in between. which has a tannish hue instead of grey. This would still be considered a Merle. 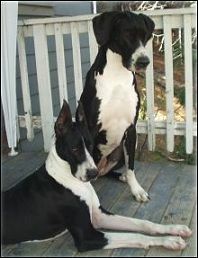 however in Great Danes that is not the case. A Merle is a Merle. Merles can vary in pattern as well as in color. often referred to as a Merlequin. 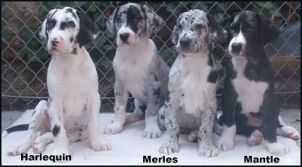 Mantle marked Merle, Mantled Merle, Boston Merle or Mertle. including Australian Shepherds,Corgis & Collies. 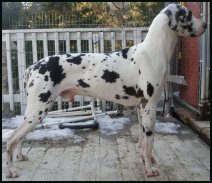 Many people do not recommend the breedings of Merles. deaf and/or blind White puppies. Goose, Gypsy-Quail, Whinny, Lass, Comet, Rocky & Keitaro. 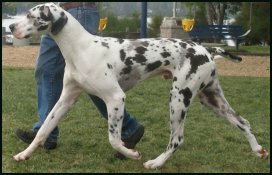 (AKC major pointed) BIS UKC CH, Multi Int'l/Nat'l CH Sixstar's The Eagle Has Landed,CGC,TT,RN ~"Eagle"
Int'l/Nat'l CH Marbledanes RWR Nitro Star,CGC,TT,TDI ~"Star"
Int'l/Nat'l CH Arctic Rose Arnljot,CGC,TT,TDI ~"Roku"
Sixstar's Three Ring Circus ~"Bailey"
Sixstar's A Little Birdie Told Me, CGC ~"Kele"
Sixstar's I Gotta Crow, CGC ~"Rooster"
UKC CH Sixstar's Fly Like An Eagle, CGC,RN ~"Dyami"
Sixstar's Little Eagle Feather ~"Feather"
MFA's Beguilin B-Bar-H Baron,CGC ~"Baron"
Sixstar's Eagle's Talon ~ "Talon"
UKC CH Hladik's Pick Six To Win, TT,CGC "Luca"
Int'l/Nat'l CH Sixstar's Rising Sun Phoenix,CGC,TT ~"Phoenix"
Service Dog- Sixstar's Third Time's A Charm,CGC,PAT,TT ~"Fortune"
(never registered) Graysondanes BugleBoy of Co B ~"Reveille"
Service Dog- Sixstar's The Lass Unicorn,CGC,PAT,TT ~"Lass"
Sixstar's Goose Beary Pie ~"Goose"
Sixstar's Cute As A Button Quail,CGC ~"Gyspy-Quail"
Sixstar's Happy Tailed Comet,CGC ~"Comet"